Getting ready to hit the road anytime soon? Travelling in a car, truck, or van for an extended period of time is both thrilling and confining. You are able to see the landscape change around you the further out you go, but it can also start to feel a little cramped inside the vehicle after the first few hours. I just returned from a trip to Montana with my sister and our total driving time was 50 hours to get back to Ontario. Driving through Yellowstone National Park was definitely the most breathtaking thing I’ve ever seen. However, towards the end of the drive, my sister and I were pretty grumpy from being stuck in the car together for so long. My advice is to be prepared with lots of solutions for keeping morale up the entire way. Stopping at gas stations and fast food restaurants to grab snacks or eat a quick meal gets old pretty quick. And while that is definitely part of the charm of setting off on the road, it’s nice to have a few of your own favourite treats and healthy options ready in the backseat. A few apples, granola bars, and bottles of water will go a long way in keeping mood levels up when you don’t feel like another round of greasy fries. Hand-in-hand with a road trip is good tunes. Crafting some long playlists ahead of time will get you excited for the trip and prepared for any type of music mood you and your travelling buddies will be wanting while on the road. The majority of your driving time will likely be spent singing along to the radio, so having your music situation all figured out will make it a much smoother ride. There comes a point in every road trip where you’ve talked about everything you could possibly want to talk about and you’ve also listened to music for hours and hours on end. Sometimes it’s necessary to change it up and what better way than hearing a great story. Audiobooks will keep everyone entertained and the kilometres will fly by before you know it. Each day of the trip have an ideal goal for where you’d like to make it by nightfall. Whoever is driving that day will have something to work towards and it’ll keep momentum going. If you’re driving in shifts, switching every few hours, have mini distance goals. You can congratulate yourselves once those goals are reached and feel good about the distance you’ve put behind you. You never know what surprises you’ll come across as you travel to different parts of the world. If you give yourself some wiggle room, you can end up having amazing adventures you didn’t even plan for. While driving with my sister, the plan was to head straight home from Montana. But my sister mentioned how Yellowstone National Park is apparently really beautiful and worth checking out. I was kind of tired and didn’t feel like adding too much extra time onto the trip, but she insisted so I agreed. I am so glad that we saw it because it was hands down the most beautiful part of the entire trip. If opportunities show up while you’re driving, think about the adventures that may happen because of your willingness to take a chance. 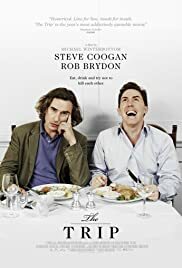 Oh, and for fun, before you hit the road watch The Trip film series, about two friends (barely at times) traveling around various European countries as culinary/travel journalists. Brilliant stuff: The Trip, The Trip To Italy and The Trip To Spain. They’re actually each six-episode BBC miniseries edited down into a 100 minute film, so if you have a little extra time, get the full series.